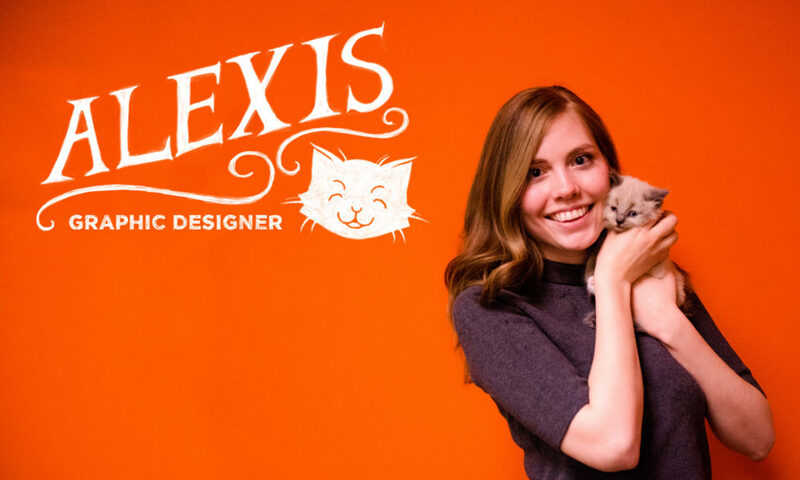 A woman of few words, many giggles and a deep love for cats basically sums up one of our favorite graphic designers, Alexis! Her love for art and design, both in and out of the office, fuel her passion every day; making her an important member of our team. When it comes to Harry Potter trivia you should take a seat, because Alexis is one of our agency wizards on the topic. Read on to learn more about a few of Alexis’ favorite things! The people here are really funny. Everyone is super talented as well so I feel even more motivated to challenge myself. To get a well-rounded experience designing for a wide array of clients. I grew up on bean burritos from Taco Villa. That sounds sad but it’s not. Villa for life. I love going to music and/or art shows with friends. Outside work, what do you like to do in your spare time? I draw and design at home! I think I’m in the right field. In my opinion, happiness + positive impact = success. Harry Potter. Who doesn’t wanna fly on a broom? Also, pygmy puffs. An art festival with Mexican food and/or hotdogs. I don’t travel very often, but I did go to a wedding in Natchez, Mississippi once. Very charming…would recommend! What is one exotic country you would like to visit? Belgium, because chocolate and waffles. Haunted house tour and chill. My freedom…by paying off all of my student loans. I sang background vocals to Beyonce’s “Diva” once. Growing my nails out. They’ve come a long way. Do you love or hate roller-coasters? Healing powers or flying powers! Can’t decide. Toys “R” Us so I could buy my niece all of the Calico Critters; starting with the raccoon family and the hot dog van. I love it all except maybe dubstep. I just want to be happy and to make cool stuff. I think it’s going pretty well so far!